This section provides a quick introduction of world line, which is the path of an object left in a spacetime frame of reference. What Is World Line? A world line is the path of an object left in a spacetime frame of reference. For example, if we define a spacetime frame of reference fixed on Sun and uses only 2 dimension x and y on the Ecliptic plane, the world line of Sun will be a straight line along the t-Axis as shown on the right hand side of the picture below. 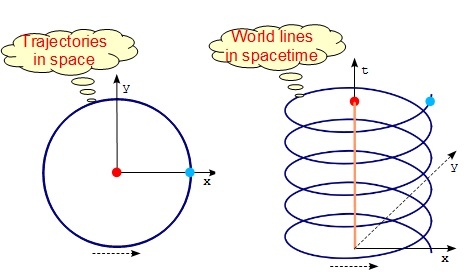 In the same spacetime frame, the world line of Earth will be a helix line. As comparison, if we look at a space frame of reference fixed on Sun and uses only 2 dimension x and y on the Ecliptic plane, the trajectory of Sun will be a stationary point and tre trajectory of Earth will be a circle. See the left hand side of the picture.